School uniforms can be contentious with parents and students, both having their own steadfast opinions as to why students should or shouldn't wear school uniforms. Most students when asked would definitely prefer not to wear school uniforms. The older students become, the more they don't want to wear a uniform. Teenagers seek to express themselves through their clothing items and feel that a school uniform literally suffocates their sense of style. 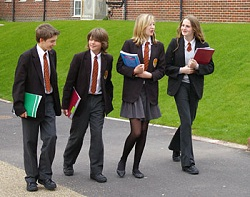 This article will help you to understand more about school uniform safety in case you are writing persuasive essay or argumentative essay for your college. Little children just entering school embrace the idea of wearing a smart, grown-up, school uniform since they feel proud to have reached this important milestone. Ties, blazers, proper dresses, and shoes are all coveted items that are very important to a school student in their early education years. As the novelty wears off so does the appearance of zit-blemished skin, bad attitudes, and teens dying to show their individuality. It is at this point that most parents and teachers agree that wearing a school uniform during the teen years is crucial for students. It teaches them discipline and conformity to prepare them for the adult corporate world they will face after school. Teens that are free to choose their own outfits and wear them to school cause all sorts of distractions and problems. This is because kids value brand names, skirt length, certain shoes, counter-culture fashion, and the latest mainstream fashion trends. In coed schools, it is more beneficial for boys and girls to concentrate on schoolwork as opposed to what their love interests are wearing. A school uniform promotes a more studious environment, keeping kids grounded without those unable to afford brands feeling inferior. Kids don't have to spend hours putting together an outfit for school. For parents it is also beneficial, as the cost of school uniforms is much cheaper in comparison to an entire school wardrobe. While teens would require wardrobes for winter and summer, younger kids would need their clothes replaced regularly since they would inevitably ruin them by playing outside at school. We as society celebrate and encourage young people to embrace their diversity and individuality. Therefore, it is arguable that making kids wear school uniforms fosters conformity, squashes children's identities, and extinguishes individual thought. Additionally, if there is more than one child in school, the cost of uniforms increases substantially with families feeling uniform costs eating into their budget. If teens are not able to express themselves individually in fashion, they begin look for other ways. They accomplish this by changing the uniform, rolling the skirts up, leaving the tie off, and adding accessories. Things like tattoos and piercings are not the most desirable form of expression for a young person to display. But some arguments suggest that by making a child wear a school uniform, we force them to express themselves in these ways. Every parent, teacher, and student have to come to their own conclusions about what they think is best for them, their school, and their kids. Currently, parents have the option of sending their kids to a school where kids where uniforms and schools where kids don't. At the end of the day, it is personal taste that is everyone's deciding factor.